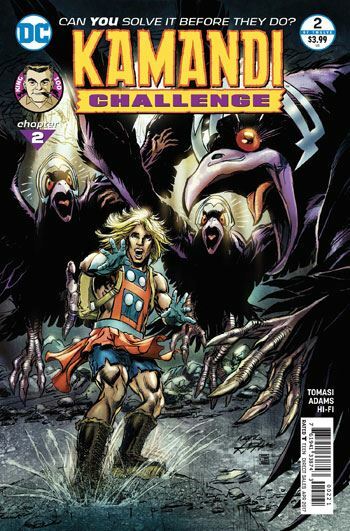 The Kamandi Challenge continues, with this second issue written by Peter Tomasi, with art by Neal Adams. Tomasi finds a very clever way out of the cliffhanger he was given at the end of the first issue. It’s good enough, and true to what has come before, that I will not reveal how Kamandi, Great Caesar and the others survive a giant nuke going off right in front of them. 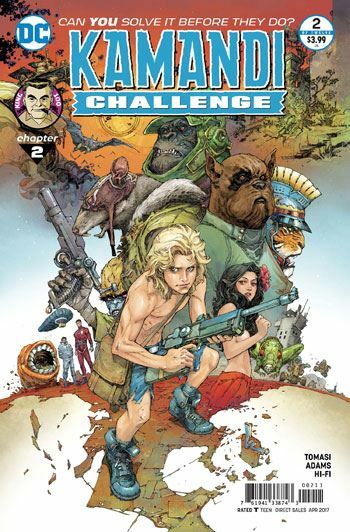 The story evokes some classic elements of the old Kamandi comic, the dismissal of Kamandi’s obvious intelligence by the animals he is dealing with, and the use of Superman’s cape. While the cape was the basis for one issue of the original run, this issue tosses in Wonder Woman’s shield, Green Arrow’s quiver and bow, and Harley Quinn’s mallet. I am hoping these items will return later in the series. Tomasi has taken full advantage of having such an early position in the overall story. While all that is really required of him is to solve the cliffhanger he was given, and set one up at the end of the story, Tomasi also throws in more teases, as well as tying the world of Kamandi to the New Gods. Apparently that was always in Kirby’s mind, though never really laid out back in the 70s. Now I am very eager to see how Solovar will wind up getting used, and the comic books as well. Should no writer choose to pick up on these elements, I will be severely disappointed. Neal Adams does an exceptional job on the art for the story, even though it’s stylistically as far from Kirby as one could get. I love the almost random use of the Manhunters towards the end of the story. This miniseries is a big DC playground.